Last updated: Feb 10, 2019. 19:00 UTC. 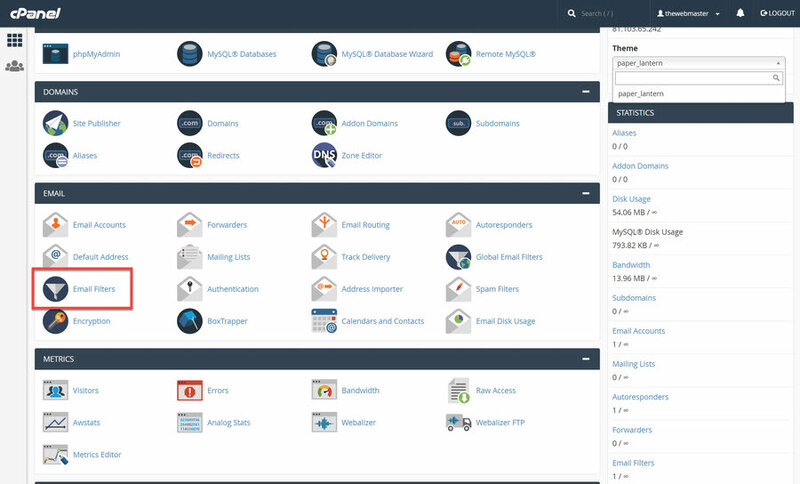 You can set cPanel Email filters from within the cPanel control panel dashboard. They can either be set Globally or on a per email address basis. They provide you with another level of control over what emails you receive and are particularly beneficial for helping prevent spam emails. With the email filters, you can set conditions to target messages that contain a specific word or phrase, From, To, or based on subject. 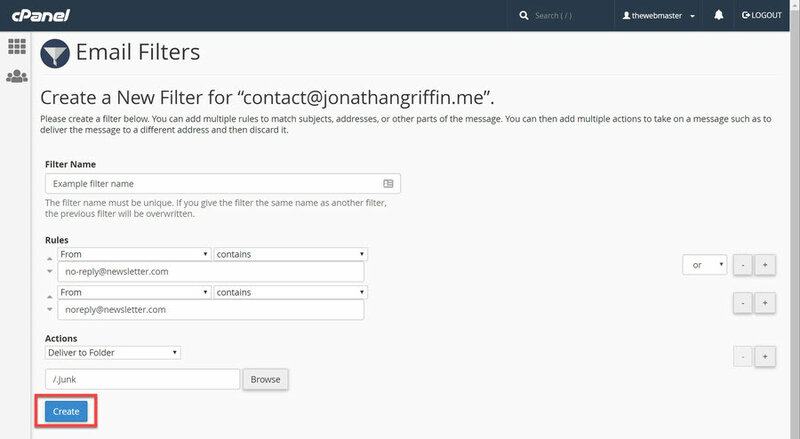 You can add multiple levels of email filters so that you can precisely fine-tune what you wish to happen with the email received. The emails that you filter via cPanel User Level Filtering can be discarded, sent to another email address, or delivered to a program (such as a support ticketing system, although cPanel email forwarding is often used for this purpose). 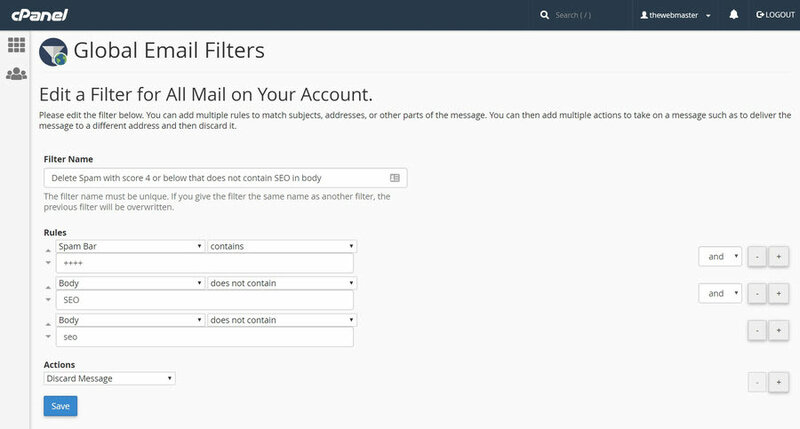 Email filters in cPanel can be set either on a user-level or globally. I’ll cover these in turn, even though they are virtually identical apart from the first couple of steps. I will then look at a couple of practical examples. Click on the “Email Filters” icon on the cPanel dashboard. Click on the 'Email Filters' icon © The Webmaster. Click “Manage Filters” next to the email address you wish to create a filter for. You can choose from email addresses you have created, as well as the default email address. Click 'Manage Filters' next to your chosen email address © The Webmaster. On this page, you will see a list of your current email filters. 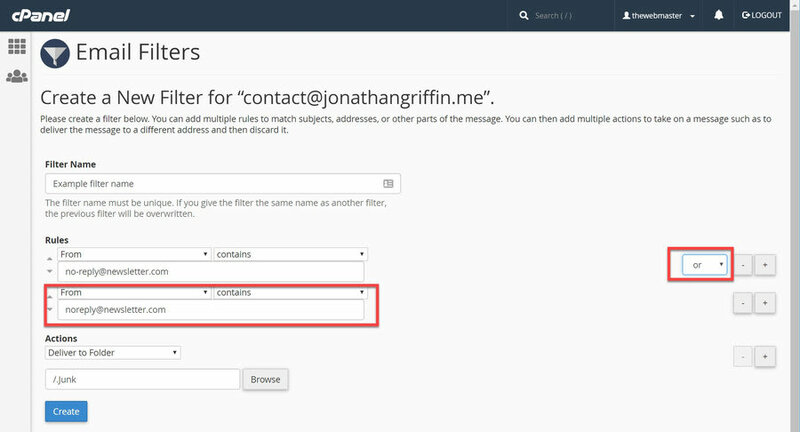 You will also be able to create a new filter for that email address. Click the “Create a New Filter” button to create the new filter. 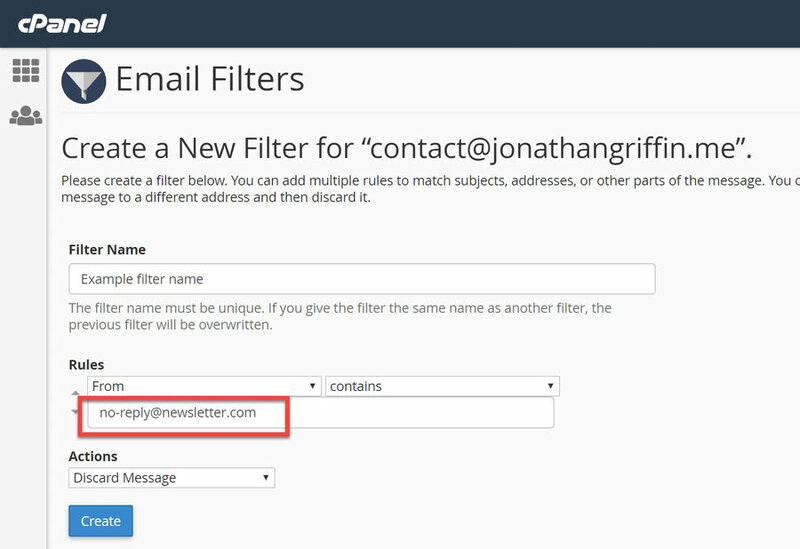 Create a new Email Filter © The Webmaster. Filter Name - Choose the name for your filter. The name you give cannot contain “Rule #” or “Converted Rule” as you can see from the above image. The filter name must also be unique. If you choose the same name as another filter, the existing filter will be overwritten. Configure Filter Name © The Webmaster. Is an error message - This will check the error message received by autoresponders, or email forwarders. List ID - The account’s mailing lists. Spam Bar - The content of the Spam Bar header that Apache SpamAssassin generated. This is depicted using plus signs (+). Spam Score - The total number of plus signs (+) in the Spam Bar. This is depicted as an integer (number). Configure Option Rules © The Webmaster. is above (numbers only) - The Spam Score is greater than. is not above (numbers only) - The Spam Score is equal to or less than. is below (numbers only) - The Spam Score is less than. is not below (numbers only) - The Spam Score is greater than or equal to. Configure Operator Rules © The Webmaster. Once you have chosen a Rule Option and Rule Operator, you will need to add what those will need to match. This could be an email address, spam score, or emails containing a specific subject or keyword. I’ll walk you through a couple of examples later, but for now, I will mark highlight all emails received from no-reply@newsletter.com. Configure Rule Match Criteria © The Webmaster. Discard Message - Deletes the message with no Failure message. Redirect to Email - Sends the email to another email address. Fail with Message - Deletes the email and sends a failure message. Stop processing rules - Does not run any filter rules. Deliver to folder - Sends the email to a specified folder. Pipe to program - Sends the email to a program or script on the server. If you choose to pipe the action to a program, the path used should be relative to your home directory. If the script the Perl or PHP interpreter, you should omit the /usr/bin/perl or /usr/local/bin/php portion. Make sure your script is executable and has the appropriate hash. In the example screenshot, I have chosen to ‘Deliver to Folder’. By doing this, you will then be able to browse and select the specific folder you wish it to be delivered. I have chosen the Junk folder in my example in the screenshot. Configure Action Rules © The Webmaster. You can configure each Filter with multiple rules or actions by clicking the plus sign next to the first rule to add a second rule. In the screenshot, you will see that I can add a second Rule Match Criteria to send a slight variation of the email address to the Junk filter as well. When using multiple rules, you will have another Operator option. In this case, I have set “or” so that either of the email address is caught. Configure Multiple Rules © The Webmaster. The final step is to click the Create button. You will then see a confirmation message. Click 'Create' to create the filter © The Webmaster. Click on the “Global Email Filters” icon on the cPanel dashboard. Click on the 'Global Email Filters' icon © The Webmaster. 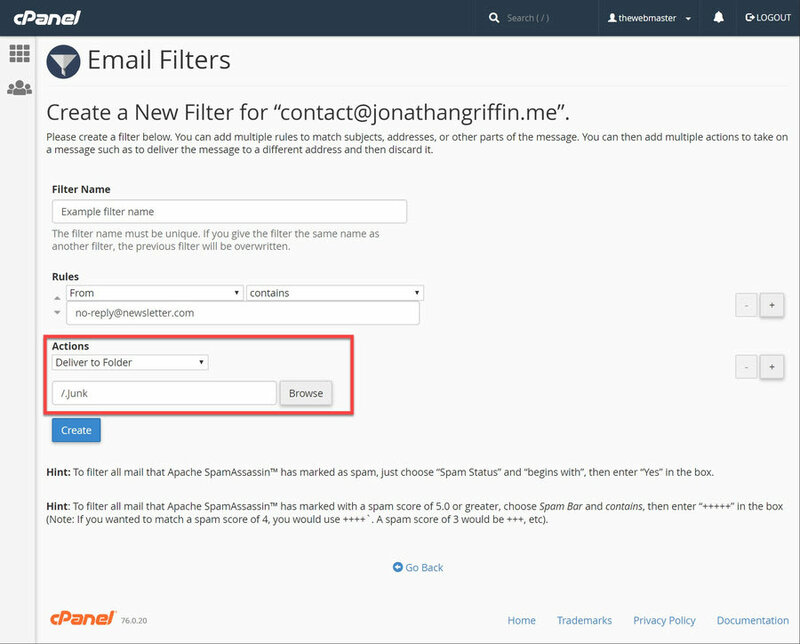 Follow my “How to Setup cPanel Email Filters for an Individual Email Address” tutorial from Step 3 above. I have created a very detailed SpamAssassin tutorial which goes in detail all the steps required to configure SpamAssassin to create a spam filter properly. It includes how to set the SpamAssassin Score (Spam Threshold Score), move spam to junk folder (Spam Box), auto-delete, and add emails to either the whitelist or blacklist. When you create rules within the Spam Filters section, it will automatically create Global Email Filters. It can be easier to configure basic SpamAssassin rules through this interface. There are times when you want more granular control over when SpamAssassin triggers an action. For example, you may want random newsletters you receive to be marked as spam unless the body matches “keyword”. This may be a particular topic you are interested in. Spam Score is less than 4. The body does not contain the keyword “SEO”. Click on the “Email Filters” or “Global Email Filters” icon on the cPanel dashboard. Go to the Filters menu © The Webmaster. On this page, you will see a list of your current email filters. You will also be able to create a new filter for that email account. Enter the following settings © The Webmaster. You can use wildcards in Spam Filters by using Regex. Providing a full breakdown of how Regex works is beyond the scope of this tutorial. For more detailed examples see this cheat sheet. 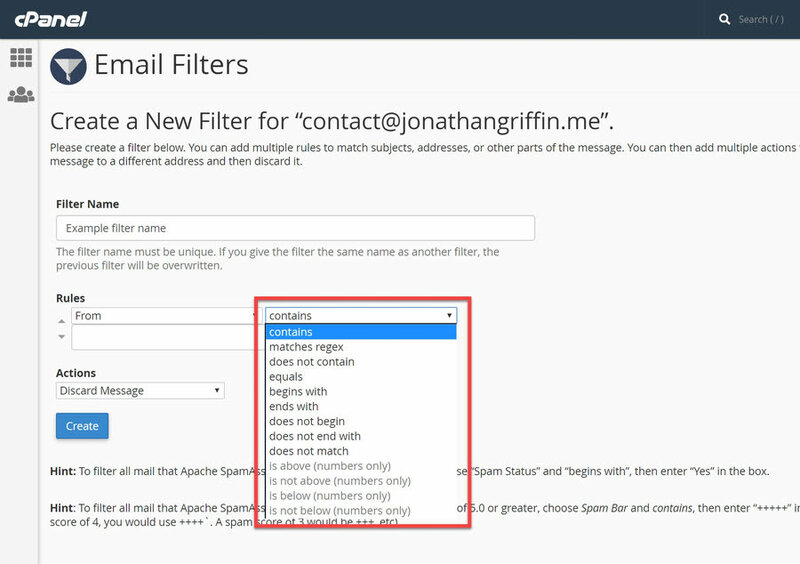 Create new Email Filter © The Webmaster. You can use the “OR” operator in this instance because the rule is set to delete the message if the body does not contain “SEO” or “seo”. If any of those variations match then the message is NOT deleted. Enter the following filter settings © The Webmaster. 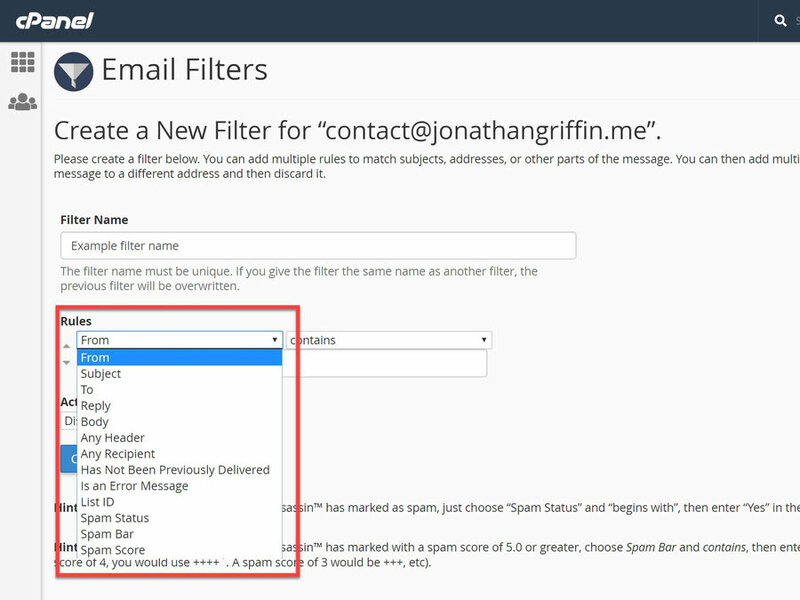 On the main Email Filter Screen, you will see an option to “Test Filter.” You will see a preset simple email message that you can modify to test your any of your Filters. Add an example email that you want to test. In this example, I added “someone@spam.com” to the From section. As I want to delete all of these emails, the result should come back as matched. Add example email that you want to test © The Webmaster. You may then want to test emails that should not get matched to ensure it does not match emails that it is not supposed to. See whether the email matched any of your Mail Filters © The Webmaster.